(CNN) - New Jersey Gov. Chris Christie, a catcher on his high school baseball team, stepped up to the plate again Monday. The New Jersey Republican joined a number of sports stars and celebrities to play in an annual charity softball game fundraising for the Boomer Esiason Foundation - an organization aimed at finding a cure for cystic fibrosis - as well as for the Wounded Warrior Project. Christie said the biggest difference between Monday's game, held at Yankee stadium, and his days as a high school catcher in New Jersey is about 40 years’ time. "I'm 40 years older, you know 35 years older, that's about it. So that's the biggest difference. And then probably the way I play but we'll have to wait to see that," he told reporters before the game. Christie, a potential 2016 presidential candidate and regular on WFAN’s sport show Boomer & Carton, played nine innings, fulfilling a promise he made a few weeks ago to co-host Boomer Esiason that he would participate in the annual softball game. Christie, wearing number 55, played third base, which he said he's played when he was older “…after I couldn't stay in a squat for nine innings" as catcher. A die-hard New York Mets fan, Christie remained true to his beleaguered team despite playing on enemy territory. "I came in with my Mets stuff on but then they gave me this uniform," he said, noting that his red and blue get-up was the same as his beloved Mets. CNN's Dana Davidsen and Ashley Killough contributed to this report. If he'd be as reasonable with the need for tax increase as he was with putting on the pinstripes, then we'd be in better shape. Catcher is the best position , you call the pitches . He should have stayed in Baseball . LOL! I can see catcher. They do the least amount of running. And this is newsworthy because ... ? Thanks, cnn. Now I. Can put back the People magazine I was just about to buy. Oh to see all of that lard out on the field trying to run would be hysterical!!! More presidential qualifications, how's that tax cuts for the rich doing creating jobs for jersey Christie? No, must be you didn't give the rich enough tax breaks, cause sooner or later, it will create jobs right, just keep giving til they start creating jobs,, now look what you've done, no money, time to cut the working mans throat, again, that's the gop economic plan, same one they've used for decades, and inequality has grown every year, their plan is working just fine. Sounds like Mrs Soetoro is espousing Affirmative Action for the POTUS job. Oh, hey. More GOPerville trivia. 4. 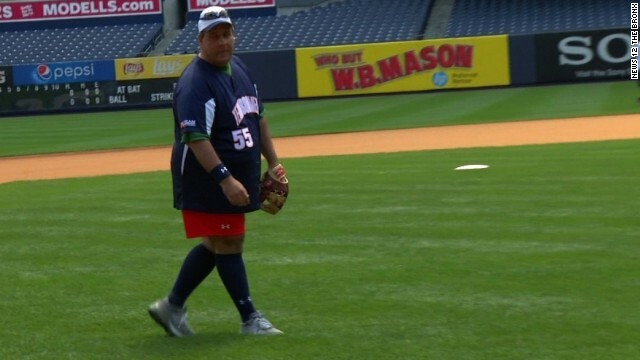 Chris Christie plays baseball (with or without uniform). 5. Mitt Romney is still President of his Alternate Reality media fan club. Did he use the state helicopter?